This week you are studying about the differences in the Muslim commutiy between the Sunni and Shi'a. Look at the map and the political cartoons below and answer the questions on the blog post. 1. What part of the world is this map located? 2. Which country has the highest population of Sunni Muslims? of Shi'a Muslims? 3. 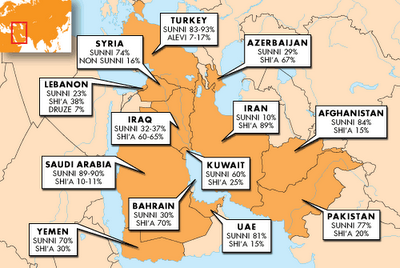 Which country has the closest percentage of Sunni and Shi'a Muslims living there? 1. Political cartoon #1: What is the Muslim place of worship shown in the background? 2. Political cartoon #1: Who are the two groups of people praying in the picture and why are they facing in different directions? 3. Political cartoon #1: Why do you think there is is a big divide between the two groups praying? 4. Political cartoon #2: What does the expression mean, "To fight like cats and dogs"? How does this expression connect to the cartoon? 6. Political cartoon #2: Why is the man trying to keep the Sunnis and the Shi'a Muslims from fighting each other? Sufism is a branch of Islam. It is a religion based on mystical communion with an ultimate reality. A follower of this tradition is generally known as a Sufi. Sufis believe they are practicing Ihsan, or perfection of worship, which was revealed to the archangel Gabriel to Muhammad. Sufism gained followers among a number of Muslims as a reaction against the worldliness of the early Umayyad Caliphate (661-750 AD). Today there are approximately 10 million Sufi adherents in Turkey alone. The Sufis have been using carefully constructed stories for teaching purposes for thousands of years. Read the story below and answer the questions that follow for the blog. 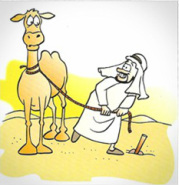 Trust in God, but tie up your camel. There was once a man who was on his way back home from market with his camel and, as he had had a good day, he decided to stop at a mosque along the road and offer his thanks to God. 1. What do you think is the meaning behind this Sufi story? Look at the five common expressions from Arabic below. Do an Internet search for the meaning behind each of these phrases and the occasions in which you would use each of them. Post your findings on the blog. C) Your age and birthday D) How long have you been a historian (or studied history in school)? The second paragraph must explain a personal goal you wish to complete this semester and how you wish to achieve it. The email should end with "Sincerely," and your first and last name. In 6th Grade we begin the semester studying the history and rise of Islam. Today, Islam is the second-largest and one of the fastest-growing religions in the world. The early Muslim community normally used simple solid color flags of black, green or white to identify themselves as believers of Islam. In the 1800s, the Ottoman Empire (which we will study this year!) 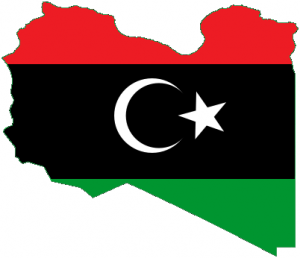 introduced the star and crescent to identify itself as an empire and its connections to Islam. What do you think is the connection between the symbol of the star and crescent and the religion of Islam? Write your thoughts on this blog in the comment box below. Look at the flags with stars and crescents on the slideshow. These are countries today which also have historical ties to Islam. Can you name the six countries to the flags below? Write the countries in the blog comment box.